This harpsichord was built by Giovanni Baffo, the leading maker of harpsichords in Venice, one of the main instrument-producing centres in Europe during the 16th century. The instrument is decorated with traditional Islamic patterns, then widely used in Venice, and also fashionable classical motifs, such as Apollo and the Muses, a suitable theme for musical instruments. This instrument has undergone a number of changes, including the altering of the range of the notes, a sign that even if musical fashions changed during the next century the prestige of Baffo's instruments remained intact. Harpsichord with one set of keys consisting of 50 notes, ranging from GG/BB to c3, with two sets of strings tuned at the same pitch. The soundboard is made of plain cypress wood, with a rosette made up of elaborate gothic tracery in parchment, built round six lobes enclosing a hexagon with concave sides. The instrument is abruptly truncated at the end. The edges of the instrument, jack rail and base of the keyboard are decorated with ivory studs. These parts, together with the nameboard and inner sides above the sound board, are veneered with rosewood, decorated with gilt moresques and inlaid with interlinking rhomboid patterns made up of ivory and boxwood. On two such rhomboids at either end of the name board the maker has signed and dated this harpsichord. The instrument is placed in a case decorated on the outside with scrolls along the bent and straight sides and a garland of roses on the outside of the lid, which was probably added about two hundred years after the instrument was made. The inside of the lid is elaborately decorated with grotesque ornament and consists of two parts, linked with staple hinges: the smaller part covers the keys and jackrail and the larger one the soundboard . The former consists of a circular batswing frame in the centre enclosing two winged putti holding up the three-crescent emblem of the Strozzi family. This frame is flanked by two moulded rectangular ones, each containing a prancing winged putto. All three frames are linked with bandwork, and the spaces in between are filled with masks and scrolls. A batswing lunette is placed at each end. The main part of the lid is dominated with a cartouche containing Apollo and the Muses. Either side are winged putti, masks, batswings lunettes and sphynxes and other grottesques. The decoration is crudely cut off at the end. The instrument was made by Giovanni Baffo, who described himself as Venetus, i.e. 'Venetian' or 'from Venice'. However, the instrument bears the triple-crescent emblem of the Strozzi family, an eminent banking family from Florence, but more associated with Naples than Venice. It is now thought that Baffo may well have made the Queen Elizabeth virginals, and so there is no reason why he should not have made an instrument for an eminent family in Florence, a city far closer to Venice that London! It came to the attention of Sir Henry Cole, the first director of the South Kensington Museum, during a year spent in Italy in 1859, when he visited the sale rooms of William Blundell Spence in Fiesole, just outside Florence. He referred in his diary (17th Feb 1859) to "a pianoforte [sic] very decoratively painted inside, dated and signed Antonio Baffo Venetus 1574 a most desirable acquisition." Just how Spence acquired this instrument remains unknown. The instrument's range of notes was probably originally C/E - f3, but was altered at a later date to the more fashionable range of GG/BB - c3. The bass notes formed a short octave, which ommitted notes that were seldom needed. There were originally two sets of strings, with one tuned an octave above the other, but this was replaced with a second set, also tuned an octave lower. This meant doing away with a bridge in the middle of the soundboard. The instrument was restored to playing order by John Barnes of the Russell Collection of Keyboard instruments in 1964. Historical significance: Although Giovanni Baffo seems not to have made any great innovations in building this harpsichord, he was nevertheless one of the most sought after makers of his day. If recent attributions with regard to the Queen Elizabeth Virginals are correct, his customers even included foreign royalty. It is possible that the inside of the lid of the outer case was painted to match an important room in the house, that had been recently decorated in the latest fashion. The fact that radical alterations were made to the stringing of the instrument at a later date indicates that Baffo's harpsichords retained their prestige long after they were first made and musical fashions had changed. 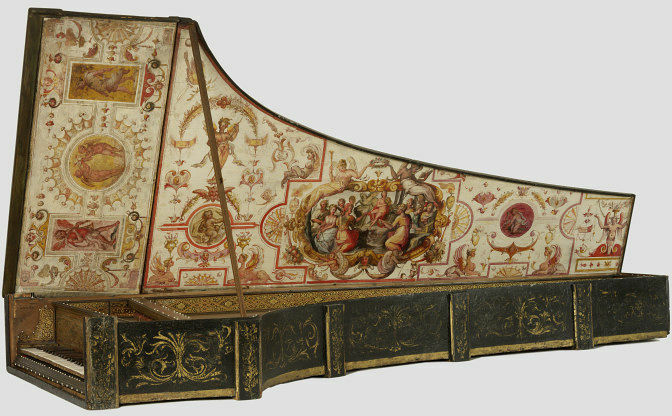 Harpsichords or clavicemballi, as they were known, were highly prized throughout Italy and were found in chambers of the well-to-do or scholars' studies or studioli. The main centres of production were Flanders and Northern Italy, particularly Venice, but until about 1600 more virginals were made in the former region and more harpsichords in the latter. 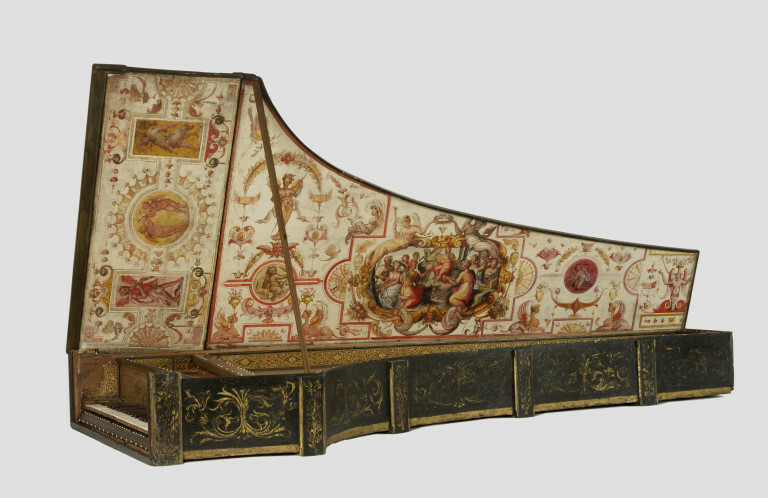 Unlike the heavier Flemish models, Italian harpsichords were light, with cypress wood carcases and fitted with protective outer cases, lavishly decorated on the inside of the lid. Being able to read music and play keyboard instruments was the mark of a princely education, as was an awareness of the mathematical qualities of music. Howard Schott: Catalogue of Musical Instruments in the Victoria and Albert Museum - Part I: Keyboard Instruments (London, V & A Publications, 1998), pp. 32 - 35. Denzil Wraight: The stringing of Italian keyboard instruments, c. 1500 - 1650. - Part Two. Catalogue of Instruments. These submitted for PhD at the Queen's University of Belfast. (January 1997), pp. 48 - 53. LP28537 Baffo Harpsichord played (6007-1859) by Valda Avelin, Victoria & Albert Museum, 5.5.64. 1. Passacaglia in B Flat - 2' 38". 2. Toccata in G - 5' 33"
3. Toccata in A Minor - 4' 28". SCHOTT, Howard; Baines; Anthony; Yorke, James: Catalogue of Musical Instruments in the Victoria and Albert Museum. Part I: Keyboard instruments by Howard Schott. Part II: Non-keyboard instruments by Anthony Baines. [Reprint 20012 of single volume catalogue with additional information]. (London, V&A Publications, 1998). 7. HARPSICHORD, Giovanni Antonio Baffo, Venice, 1574 Mus. No. 6007-1859I. 1.The instrument is inscribed in two panels of the decoration above the keyboard: JOANES AN-TONIVS BAFFO VENETVS MDLXXIIII. 2.The present keyboard compass is GG/BB-c3, fifty notes with bass short octave. The ivory-covered naturals with arcaded carved wooden fronts measure 112mm long (from the rear of the sharps) by 22mm wide, with key-heads of 40mm length. The sharps of ebony are bevelled and measure 71 mm long by 11-12mm wide. The standard measurement is 504mm. Two sharps bear traces of a gold line across the front. The jacks are of pearwood with beech tongues. Almost all are original. 4.The case, baseboard and barring are of a coniferous softwood. The soundboard is of cypress. The wrest-plank and the original keys (see below) are of sycamore, as is the balance-rail. Modifications of the keyboard were made in beech. The box slide registers are of pearwood with sycamore sides. Boxwood blades at the distal end of the keys fit in a rack. The case of the instrument itself is decorated with ivory studs along the top edge and the jack-rail. The inner face of the case and the jack-rail, nameboard and key-blocks are all veneered with rosewood, partly inlaid with boxwood and ebony, and bear delicately gilded arabesques. The cypress soundboard contains a carved wooden rose of intricate geometrical design with some details executed in cut parchment or card. The diameter of the rose is 132mm. Mouldings are solid rosewood. Scantlings are as follows: baseboard, 12mm reducing to 10mm at the tail; cheek, spine and bentside, 3.8 to 4.2mm. The outer case, from which the instrument can be withdrawn, is painted inside with grotesque decoration surrounding a cartouche with a scene of Apollo and the Muses, all on a white ground. (The source for the cartouche has been identified by Sheridan Germann as an engraving by Giorgio Ghisi [1520-1582] after a painting by Luca Penni of c.1550, which is in turn derived from Raphael's 'Parnassus' of c. 1511 in the Vatican Segnatura.) The outer faces of the case were originally decorated with gilt scrollwork on a black or dark blue ground; some of this decoration has been revealed by a recent cleaning (1964) but the painted decoration which had for so long hidden the original embellishment has been allowed to remain on the lid and on the long side of the outer case. This later layer consists of garlands of flowers painted in a mid-eighteenth-century style on a sage-green ground. There is no stand. It is considered that the painted decoration of the outer case dates from C.1570 so that the case is contemporary with the harpsichord. Details of this painting accord with the painted ceiling of the Salotto at the Villa d'Este in Tivoli of 1568 and contemporary decoration in Venice. The inlaid decoration of the instrument itself is quite similar to that of the Venetian chess and backgammon board of c. 1580 in the Museum's collection (No. W. 9-1972) and shows the influence of Near Eastern lacquer work. 5.The instrument was purchased in 1859 for the sum of £6 7s, 0d. 6. In common with many Italian harpsichords of the earliest period, especially those by such eminent makers as Giovanni Antonio Baffo, the present instrument has undergone numerous alterations in the course of its active life extending well into the eighteenth century. This fact testifies to the quality of the harpsichord and the esteem in which Baffo was held, just as the products of the Ruckers workshop of Antwerp were so prized by musicians and connoisseurs that they were rebuilt, enlarged and even faked (see No. 23). The alterations to the Baffo harpsichord may also have been carried out to accommodate the change in the prevailing pitch of stringed keyboard instruments in Italy, or perhaps changes in the nature of stringing material, which it is presumed took place during that period. An editor's note added to the text of Russell (1968) summarized the principal changes in the instrument as reported by Mr John Barnes, who had restored it in 1964 to playing order. However, Mr Barnes has since refined his analysis of the rebuilding history of the instrument and the following summary of his revised conclusions is based on Barnes (1971). The original keyboard compass of C/E-f3 was subsequently altered, possibly some fifty to sixty years after the instrument's original construction, to a fifty-note compass of GG/BB-c3, the present range of the harpsichord. Presumably at the same time the original disposition of the harpsichord, one 8-foot and one 4-foot register, was altered to the typical later Italian disposition of two 8-foot stops. There are marks on the soundboard where the 4-foot hitchpins and even the 4-foot bridgepins were located. The position of the 4-foot nut on the wrest-plank can also be determined. Calculations from the resulting measurements confirm that the 4-foot scaling agreed with that of the 8-foot strings. Both the 8-foot and 4-foot nuts were located close together, with both sets of tuning pins in front of the 8-foot nut. The octave strings presumably passed through holes in the 8-foot nut (the present nut is a rather crude replacement and does not follow the line of the original one). With such an arrangement of tuning pins and nuts, it is to be assumed that the shorter strings, those of the 4-foot stop, were plucked by the jacks closer to the keyboard. Indeed, one of the box slides of the harpsichord has the word Otava written on it, and this slide was certainly in the front position when it and the wrest-plank were bored by woodworm. When the second 8-foot register was substituted for the 4-foot, the bridges and hitchpins of the latter were removed and its jacks lengthened so that their plectra would reach the higher level of the 8-foot strings. The pitch of the instrument after the keyboard alteration and the replacement of the 4-foot register by a second 8-foot was raised by about a fourth, assuming that the strings themselves remained tuned to the same pitches. These modernizations made the harpsichord resemble new instruments being built at about the same time. At a later stage, probably towards the latter part of the eighteenth century, the harpsichord underwent a further and most unfortunate rebuilding. (The details, as given in the 1964 restoration report, are found in Russell 1968, 34f.) The compass was crudely enlarged from fifty notes (GG/ BB-c3) to fifty-four notes (C-f3), and some 250mm cut from the tail end of the instrument. This truncation clearly shows in the decoration of the lid's inner surface and the rearmost panel of gilded arabesques of the bentside of the case. In spite of the vicissitudes of repeated rebuilding, the harpsichord remains an outstandingly fine example of the work of this celebrated maker. The restoration report and the further study made during the preparation of the Museum's measured drawing of the instrument both bear witness to the impeccable workmanship of the mechanical parts and the concealed structure. For instance, the original jacks still fit perfectly in their guides and are uniform in thickness to a tolerance of 0.1 mm, an extraordinary degree of precision in the sixteenth century. Inscribed in two panels above the keyboard: JOANES ANTONIUS BAFFO VENETUS MDLXIIII. Ivory covered naturals and ebony sharps. Pine case and body, cypress soundboard. The decoration inside the lid consists of grotesques, putti and a cartouche of Apollo and the Muses, derived from a painting by Lucca Penni (about 1550). The present range, thought to have been altered in about 1630, is fifty notes, GG/BB (Short Octave) - c3. It now has two 8 foot registers. This instrument has been considerably altered; notes were added in the base, and two eight foot stops would seem to have replaced the original four foot and a eight foot stop (i.e. two sets of strings, the former an octave higher than the latter). The expressions "Eight Foot" and "Four Foot" are taken from organ terminology and originally referred to the lengths of pipe. Surviving instruments by Baffo date from 1570 until 1581, including one in the possession of Ferdinand de' Medici of Florence. 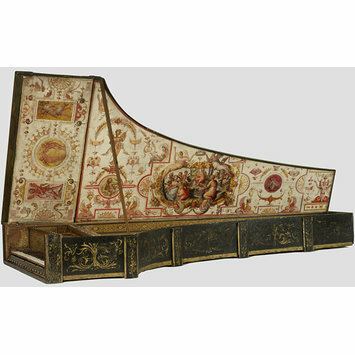 Harpsichords like this could be imposing, visually impressive objects, contributing to the decoration of a room as well as filling it with music when played. The painted case of this example includes the coat of arms of the Florentine Strozzi family, who were known musical enthusiasts. As instruments were produced in greater quantities in Italy during the 15th and 16th centuries, Venice became an important centre of manufacture. Inscribed above the keyboard: ‘JOANES ANTONIVS BAFFO VENETVS MDLXXIIII’. With a coat of arms with three crescent moons, probably belonging to the Florentine Strozzi family.